The reunion dates have been set and the hotel selected for the 2018 Golf 2/5 Reunion and in case any of you didn't know the city voted on at the 2016 Cincinnati reunion, it will be held in my home town of Santa Fe, New Mexico! 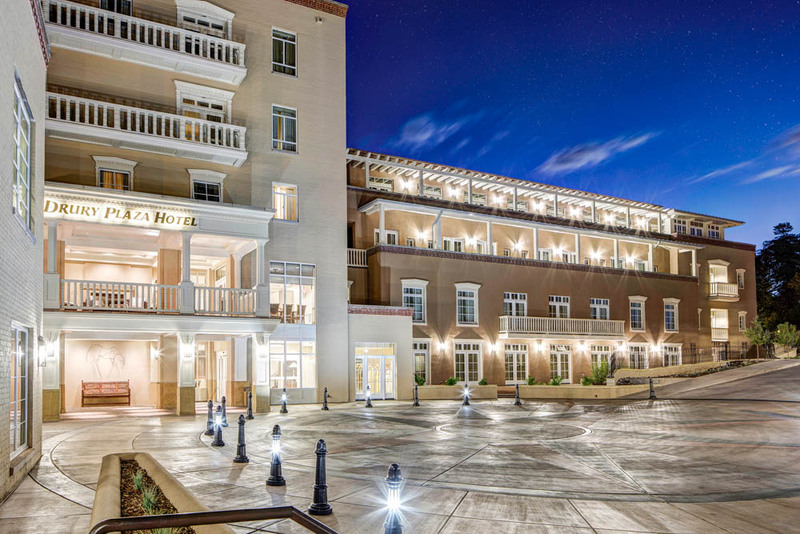 The dates for the reunion will be from October 24th thru the 28th and the hotel will be the Drury Hotel in Santa Fe. As you all know, we've tried to hold our reunions in the mid-September time-frame when the worst of the summer heat is over, tourist season is mostly over and the kids are all back in school. I know there are not too many of you who have visited Santa Fe before but it is a prime tourist destination and the tourist season does not taper off until after the Albuquerque Int'l. Balloon Fiesta which is the first couple of weekends of October. As we discussed dates for the Santa Fe reunion in Cincinnati, is was suggested that we hold it during the Balloon Fiesta weekend but, unfortunately, even though the Balloon Fiesta is held in Albuquerque, 60 miles from Santa Fe, all Santa Fe hotels fill up as well and hotel room prices are not affordable. So the best time to hold it after the tourist season is over in late October. * Wed. Oct. 24 - arrival in Santa Fe and check in at Drury Hotel. Meet-and-Greet group dinner in the evening probably around 1800 hrs. (Note, this is a change from the itinerary sent out in Feb.) The dinner, which will be a traditional New Mexico dinner, will be held in the hospitality room provided to us by the hotel. * Thurs. Oct. 25 - City trolley tour in the morning (which will provide interesting facts about Santa Fe which was founded by the Spanish in 1610 and points of interest. * Thurs. Oct. 25 - High Tea (which will include finger sandwiches, assorted exquisite mini pastries, coffee & fruity sangria) strictly for the ladies. This will be hosted by Melba Ortiz in the G 2/5 hospitality room around 11:45 AM (after drop-off back at the hotel from trolley tour). This will provide an opportunity to meet newcomers and visit with each other while highlighting the best places to shop and eat in the area and ask questions about places to visit and things to do in Santa Fe. Free evening to enjoy your choice of one of Santa Fe's many fine restaurants. * Fri. Oct. 26 - Bus trip to Angel Fire, NM and the Vietnam Veterans Memorial with lunch at Angel Fire. This will be an all-day event returning to Santa Fe around 5 PM. Free evening to enjoy your choice of one of Santa Fe's many fine restaurants. * Sat. Oct. 27 - Business meeting in the morning and free day with banquet in the evening. Banquet will also be held in the hospitality room. Menu will consist of a beef (steak) dish (which will all be prepared medium as the chef's cannot prepare large numbers of steaks to order), a fish dish of salmon, and a vegetarian dish with desserts and coffee. The raffle will be held after the banquet. Again, the hotel, as I've said above, will be the Drury Hotel in Santa Fe and the nightly rate is $129.00 and is situated in downtown Santa Fe! This daily rate is a special rate for our group and it includes a free breakfast daily and free hors d'ourves each evening which also includes 3 free alcoholic or soft drinks so it's a very reasonable price for a very nice hotel in downtown Santa Fe. The hotel has also provided the following information: "The link below will allow your attendees to book rooms online. If guests prefer to call our toll-free number to secure reservations, they may do so by calling 800-378-7946. If it does not pull up the group information automatically, please click blue "Enter a group number" and enter 2331500. Then click verify group to begin making a reservation." Note: These room rates are also good for the day before and the day after the reunion! I want to remind you Santa Fe is at an elevation of 7,000 ft. so the temperatures in late October will probably be in the low 60s to high 50s during the day and low 40s and possibly as low as freezing at night so plan accordingly and bring warm enough clothing. I also wanted to ask attendees to bring an item(s) (if they can and/or would like to) for our Association fund raising raffle that's held during our Saturday evening banquet. Our reunions offer an opportunity, through our raffles, to raise money for the Association. It also provides additional funds at the reunion to cover expenses (mostly unexpected) above and beyond those that have been covered by the attendees. Please email me at LSO.VNGRUNT@YAHOO.COM and let me know if you will be bringing an item(s) for the raffle and what it is. I will be following up with more information as the itinerary firms up. I also have to line up the bus company for the trip to Angel Fire, the City Trolley tour and the meet-and-greet and the banquet to figure out the costs per person. I hope to have that all ironed out in the next few weeks so you all can plan accordingly. As I said, Santa Fe is a primary U.S. and world destination and is the second largest art market in the U.S. after New York City. I hope that as many of you as possible will try to make it because I think you will very much enjoy Santa Fe and our unique "Northern New Mexican" cuisine and also because we're all getting older and it's great to see our extended Golf 2/5 brothers whenever possible. Also, please bring whomever else you want, children, other family members and friends--all are welcome! I have a block of 30 rooms reserved for us and this block will be available until 07 Sept. 2018--reservations after that date will be at the regular price so don't delay in making your reservations. I will send out periodic reminders as well. If you have any questions, please don't hesitate to contact me. My email address is: LSO.VNGRUNT@YAHOO.COM.